Caregivers face an ongoing challenge in dealing with the difficult emotions of those we care for and nurture. When it comes to anger, despair, guilt, or sorrow, what are the best ways to respond? What does it mean if a person we are caring for feels anxious, fearful, frustrated or stressed? If we notice apathy, aggression, shame or suspicion, what can we do to try and understand what a person is feeling as we work to help them? 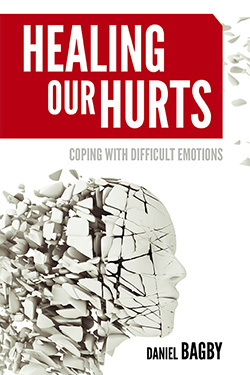 In Healing Our Hurts, Daniel Bagby identifies and explains all the dynamics at play in these complex emotions. Offering practical biblical insights to these feelings, he interprets faith-based responses to separate overly religious piety from true, natural human emotion. This book helps us learn how to deal with life’s difficult emotions in a redemptive and responsible way. Daniel Bagby is the Theodore F. Adams Professor Emeritus of Pastoral Care at the Baptist Theological Seminary at Richmond. He holds degrees from Baylor University (B.A., M.S.) and Southern Baptist Theological Seminary (M.Div., Ph.D.). Dr. Bagby has pastored for almost thirty years, served in two pastoral counseling centers, and as chaplain to a juvenile detention center and a women’s prison. A frequent national speaker on pastoral care issues, Dr. Bagby has authored numerous articles and seven books, including Crisis Ministry: A Handbook and Beyond the Myths: The Journey to Adulthood. Dan Bagby combines the best of wisdom and care. He is a pastoral counselor who is both a compassionate pastor and insightful counselor. This book is a must read for both clergy and lay people. Reading Dan Bagby’s offering will help each of us to become wiser and more caring to others and to ourselves. Anger, apathy, doubt, envy . . . you are going to think about these (and other) emotions in fresh ways after reading Dan Bagby’s new book. You’ll also view some familiar biblical characters a little differently. His practical steps for dealing with some of these issues will guide you. Enjoy the ride!